This was the view in Kamloops in April 2014. Will it be similar in April 2018? MUST BE spring — gas prices are about to go up again. There are all kinds of excuses whenever it happens — refineries shutting down for maintenance, fluctuations in supply and demand, more cars on the road. One year, it was blamed on Ukraine. An expert predicts a litre of regular will soon cost around $1.60 down at the Coast. With the difference in taxes, that would mean something like $1.30 in the Interior, and that’s nowhere near a record — we’ve edged into the 1.40s at times. If I could actually predict what’s going to happen at the pump with any certainty, I might hang out a shingle and charge for it. One thing we know about around here is wild fluctuations. One day it’s $1.07.9 a litre, the next day it hits $1.20.9, and nobody has an explanation. Supposedly, distance explains variations from one place to another. Kamloops is generally a few cents cheaper than Vernon, for example, but I have yet to figure out why Falkland should be less than Kamloops on some days. Prince George residents, by the way, were paying 11 cents less than we were yesterday. Figure that one out. And why is it that as soon as the snow melts, gas prices take off? Why is it that refineries suddenly have a need to send gas prices skyward when we hit the Victoria Day long weekend? Or, it seems, any other long weekend? None of it makes sense to me. No matter how much gas is available, and no matter what the prices, we still drive as much from one day to the next. And I can’t remember the last time local stations ran out of gas. Some experts say the Trans Mountain pipeline will lower gas prices, others say no. I side with the latter — I doubt Kinder Morgan is spending billions on a pipeline so it can give us cheaper gas. No matter what, we’re going to keep getting hosed at the pump. Strategic shutdowns of two refineries in BC at the same time pushes the price up and pays for the maintenance shutdowns. The 24 to 48 hour price gouging is based on the same logic about the dog !!! you know ” because it can ‘Selective boycotts could stop this. Fuel prices in North Kam are often 5 to 8 cents less than in south. Why do the prices all go up within minutes at all area stations ? It’s a windfall profit,They don’t all fill their tanks at the same time so they profit by upping the prices on whats left in the tanks. Don’t forget the B/S about the Falacious law of “Supply and demand” That is based on greed. More carbon taxes coming in April so the lower mainline and all of us can pay even more. I am just going to run out and hug a tree. Do your research. Prince George has a gasoline refinery so it is cheapest. 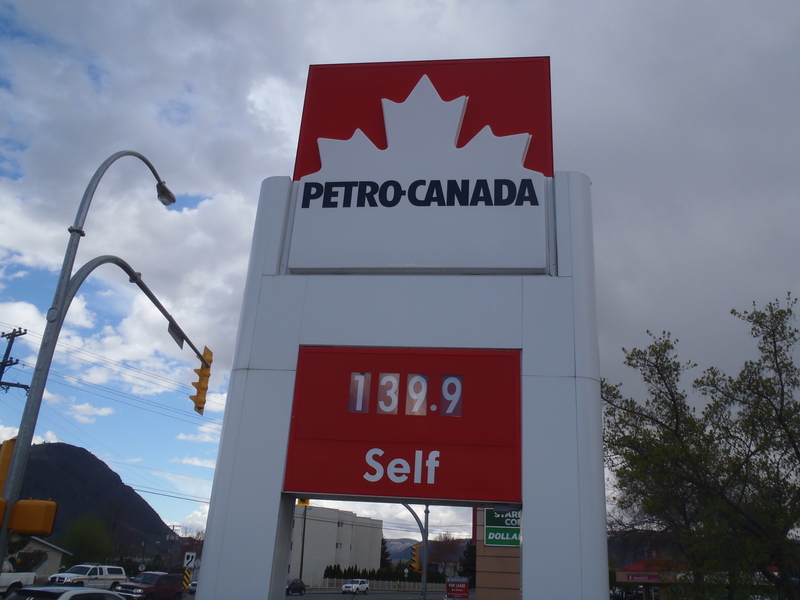 Kamloops has a terminal on the Kinder Morgan pipeline where the gasoline is pumped onto tanks for distribution so the price increases based on distance from there. No question the excuses should be prosecuted and market fairness should be the norm. However there is a sure way to minimize the bite…drive only when needed, keep the vehicle well maintained and don’t idle. High gas prices will also possibly push fuel thefts, so lock it up!